What is Uwami and Shitami? Large fish that are caught are always kept and transported on their side with their heads facing left from the port to the market and to the restaurant where they are served. The part of the fish facing down when in this position is called “Shitami” or the “bottom body” and the part facing up is called “Uwami” or the top body. The Uwami costs more than Shitami. This is because the Shitami takes on the weight of the Uwami, reducing the freshness and possibly causing cracks in the body (cracking occurs on the edges of the muscles). 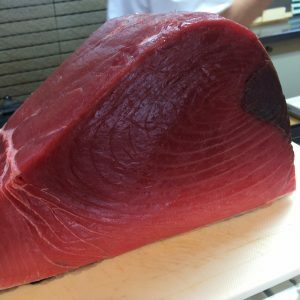 Posted on May 21, 2018 September 11, 2018 Categories Basic KnowledgeTags Fatty tuna, Maguro, Medium Fatty Tuna, UmamiLeave a comment on What is Uwami and Shitami? Why is sushi with tuna topping so expensive? A purchase of raw tuna costs at least JPY 30,000 per kilogram. Furthermore, good tuna is judged not only by taste, but appearance is also highly regarded. 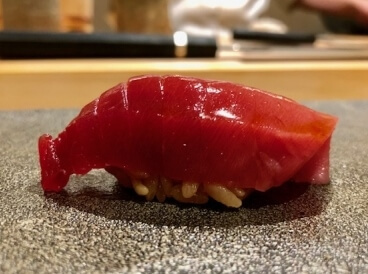 The surface is gradually oxidized by letting it sleep (mature) and the sushi chef makes sure that parts are cut of as they change color, when the timing is perfect for both the taste and appearance. In other words, skin is taken from the freshly purchased tuna, the meat of the fish darkened by blood (the blackened area that can’t be used as sushi toppings) is removed, the parts that have changed color are shaved off and then only the remaining, best parts used as toppings are left. This is why the price is high. Posted on February 5, 2018 September 11, 2018 Categories Basic KnowledgeTags Edomaesushi, Fatty tuna, Maguro, Medium Fatty Tuna, Nigiri sushi, Sushi IngredientsLeave a comment on Why is sushi with tuna topping so expensive? You know fatty tuna, medium-fatty tuna and lean tuna, but have you heard of the more rare parts of the fish? A single bite of the same bluefin tuna differs greatly depending on the part of the fish it came from. The body of the fish is broadly categorized into the dorsal (back) and the ventral (belly) sides, which taste completely different. Of course the meat near the head tastes completely different from the meat near the tail. If you dig even deeper, there are parts that aren’t as well-known as the Ohtoro (fatty), Chutoro (medium-fatty) and Akami (lean) tuna meats. I’d like to explain those now. “Hachinomi” is the meat from the crown of the head. It is fatty and rich and also called “Head Toro”. Only about 1kg of this precious meat can be taken from even a very large fish, and it is only shared with regular, loyal customers. “Hohoniku” or cheek meat is taken from below the eye, seasoned, grilled and made into gun-kan rolls. The taste is enhanced in this part by grilling. “Kamatoro” is taken from behind the jaw. It is known as “shimofuri” or marbled meat. 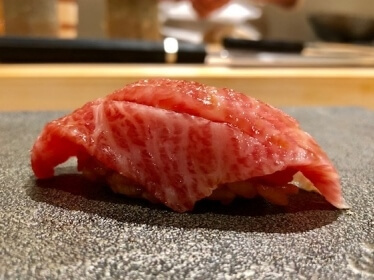 There are no veins in this part so the meat is soft and the marbling is more detailed than Ohtoro, so it is sticky and melts in your mouth. The balance of fat and sweetness in this part is unparalleled. “Chiai” is the part with the most veins, so it is a dark red color. It has a strong odor of blood and has multiple times the acidity of the lean meat, so it is not used as a sushi topping. 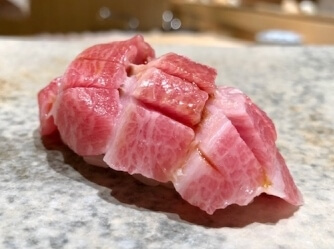 “Chiai Gishi” is near the Chutoro and some say that it is the most delicious lean meat there is. “Wakaremi” is a precious part with very little meat found on the next to the dorsal fin. The part especially close to the dorsal fin is popular and called “Setoro” or back toro. The light taste is a combination of the deliciousness of both the lean meat and that won’t fill you up. 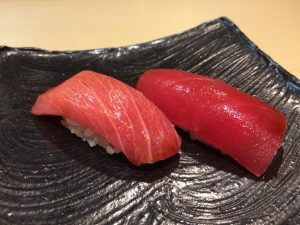 However, this part is hard to get, even in high-quality tuna and is not available except to regular customers in almost all sushi restaurants. If you are fortunate enough to get an opportunity to taste these , you can take it as proof that you have been accepted as a regular and loyal customer. It is difficult to distinguish these parts by appearance alone, so make sure you try them at a sushi restaurant you can trust. Just for your reference. 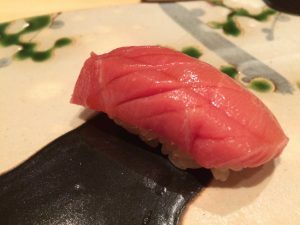 Posted on November 20, 2017 April 11, 2019 Categories EdomaesushiTags Fatty tuna, Maguro, Medium Fatty Tuna, Nigiri sushi, Sushi Ingredients2 Comments on You know fatty tuna, medium-fatty tuna and lean tuna, but have you heard of the more rare parts of the fish?